When cells from the connective tissue collide, they repel one another – this phenomenon was discovered more than 50 years ago. It is only now, however, that researchers at the University of Basel have discovered the molecular basis for this process. Their findings could have important implications for cancer research. Fibroblasts are motile constituents of the connective tissue and also regulate its stiffness. Moreover, fibroblasts play an important role in malignant skin diseases such as melanoma. 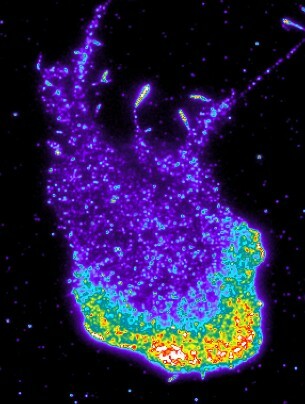 In research, they serve as a model system for studying cell migration. In the early 1950s, the English researcher Michael Abercrombie discovered that colliding fibroblasts repel one another and, in the process, change their direction of motion. He called this phenomenon ‘contact inhibition of locomotion’. Although individual proteins were identified as key factors in this process, the molecular basis of this reaction remained something of a puzzle. In particular, it was unclear which repulsion signals were involved in the process, how these signals entered the cells from the outside, and how they influenced the cytoskeleton, which in turn regulates the cell’s movement. The repulsion factor Slit2 binds to the receptor Robo4, whereupon the signal enters the cell’s interior and activates srGAP2. This molecule consequently inhibits the regulator Rac1, which coordinates the cytoskeleton. The inactivation of Rac1 causes the cell to retract – such that the two cells repel one another. If the function of Slit2, Robo4, or srGAP2 is deactivated, colliding cells will stick to one another and will not separate as easily. Intriguingly, the repulsion machinery is localized at the front – even in freely moving cells. By assembling this kind of a ‘molecular bumper’, the cell is prepared for collision with another cell. Where exactly this bumper must be positioned – namely, only in parts of the cell that are moving forwards – is determined by the cell’s geometry, which in turn is deciphered by srGAP2. The integration of membrane curvature and repulsion signals ensures that cell-cell repulsion takes place at the correct location. This repulsive reaction could play an important role in cancer metastasis. This is supported by the fact that the expression of Slit and Robo isoforms is deregulated in several tumor types.